Pierate - Pie Reviews: Pierateers desperate to beat the Pie Factory challenge! 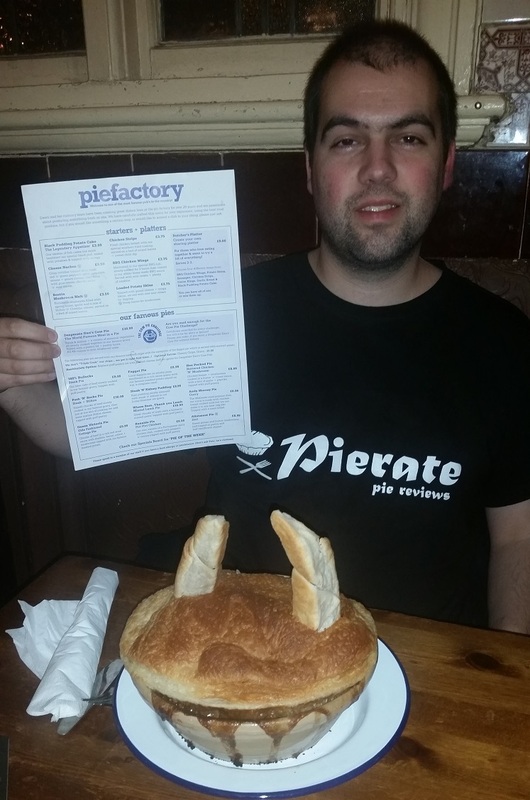 Pierateers desperate to beat the Pie Factory challenge! Some pubs just have a token pie on their menu. Real pubs have token ‘other food’ on their menu! And Mad O'Rourkes Pie Factory in Tipton, Birmingham is a fine example of the latter! It was great to chat to owner Peter, who with his wife has run the pie pub for about 20 years now. And there’s no denying they are well known in the West Midlands – to the point where people travel from across the Midlands to visit and try one of their pies. Peter even mentioned there’s no real need for them to advertise, as word of mouth does the job for them! 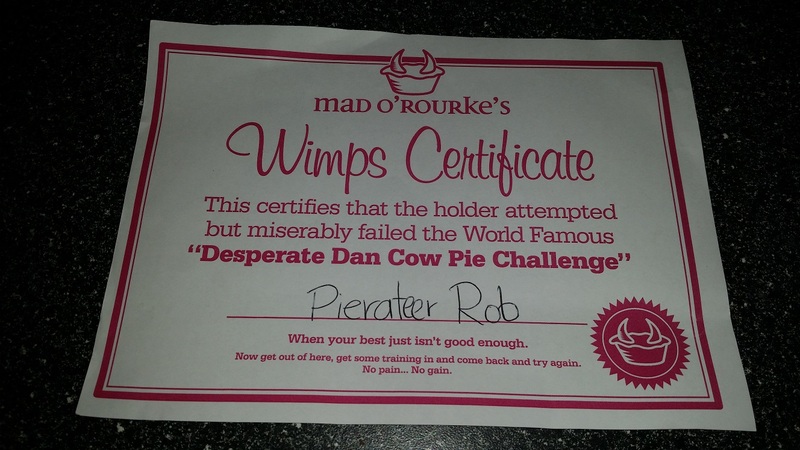 And it’s quite true – there have been plenty of work colleagues and others in Birmingham who have questioned why the Pierate Ship hadn’t yet set sail to Tipton to rate the pies there and, more specifically, to take on the Desperate Dan Cow Pie Challenge! 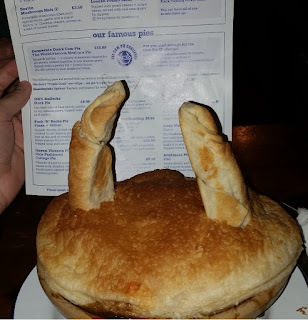 So on day three of British Pie Week 2016, with Pierateers Sam and Tim in tow, I set off to attempt the Desperate Dan Cow Pie Challenge. Put simply, this is a mega pie eating challenge! It’s a 4lb pie consisting of steak and kidney and a variety of seasonal vegetables, slow cooked in their famous gravy. 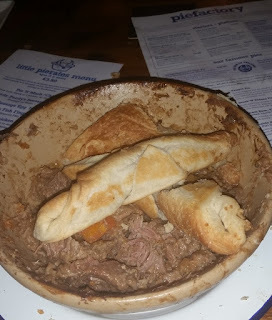 Mine contained whole pieces of potato, slices of carrot and I believe a bit of butternut squash alongside the steak and kidney, though I’d be lying to say this wasn’t a pie absolutely dominated by the pieces of steak in the pie! Oh, and did I mention the pastry horns?! Topped with a puff pastry lid, this pie is absolutely full to the brim. Enough filling to fill at least 3 normal sized pies! And so much of it was the steak – I was shocked to find myself saying “There could be a bit more vegetable in this pie!” At £10.99 for the pie, which containing potato and other veg is in fact a meal in itself, I was surprised how much meat they packed into the pie! It had to be noted however that while nice, the meat was a little chewy and fatty in places, and boy were you chewing for a while to get through all the pieces of meat in the pie! After one and half hours of eating, I finally had to throw in the towel, with about a third to a quarter of the pie filling remaining. I have to admit that while I enjoyed the flavour to begin with, eating that much of the same filling finally got to me, which is why I think this pie is really a novelty, rather than a practical option, on a pie menu. It’s not a luxury pie filling but that’s not what it’s there for. And there’s nothing wrong with a novelty pie! I had sadly failed my cow pie challenge, and got the certificate to prove it. But at least I can say I attempted The Pie Factory’s Desperate Dan Cow Pie Challenge! And if it’s any excuse, I had been judging about 12-15 pies at the British Pie Awards earlier in the day – perhaps not the best plan before eating a massive pie! 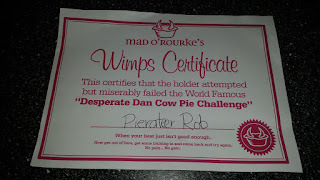 We love that the kids menu at Mad O'Rourkes Pie Factory is called the "Little Pierates Menu" and that you get a certificate for completing, or in my case failing, the Desperate Dan Cow Pie Challenge! The main downside of this pie is that it is a top-crust pie, which does lose it some points on our pie rating scale for not being fully encased. That said, it still manages to achieve Pierate Recommended status. And just to note, the pastry horns are very thick (to stay standing upright) and served cold, so not really to be eaten. That said, I didn’t even manage to complete it as a top-crust meal, so that extra side and base pastry would surely have been the end of me!!! All the pies served in the pub are top-crusts or contain no pastry (like the Andy Murray Curry “Pie” topped with naan bread! ), but there are fully encased pies available to take home with you for just £2 each, which Pierateer SJL will review separately. However in-spite of the pies being top-crusts and me being defeated in the pie eating challenge, there is something very endearing about this pub and its love of pies. The fact that people far and wide come to try their pies and take in the pie factory memorabilia which adorns the walls is testament to their long-lasting commitment to pie. And for that alone, I commend you to visit and give their pies a try sometime! You may even beat me to getting the Pie Challenge winners certificate! The score below commends the fact the pie was packed with steak at a very reasonable price for such a large pie (4lbs worth!) It is hard to fully compare it to other, normal sized pies due to it being such a large volume pie, eaten in a competitive way and just a top crust, but I’ve pie-d my best!